Elizabeth Burns: John Smith Escapes Again! John Smith Escapes Again! by Rosalyn Schanzer; National Geographic. Grade Level: about 2nd to 5th. 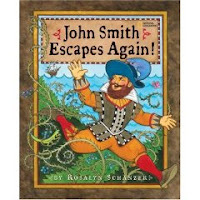 The Plot: John Smith, 1583 to 1631, is the ultimate real life escape artist, whether it's escaping being a pirate, being a slave, or escaping jail. The Good: This biography of Smith is told via the framework of his many and varied escapes. Each escape is introduced by brief facts of Smith's life. I didn't know anything about Smith other than his association with Jamestown, and this is great way to discover the rest of his story. For example, I hadn't realize that Smith was so well traveled, or the number of things he had done both before and after Jamestown. I liked the format; it is colorful, with plenty of maps, and when it says what year Smith did something it gives his age. Now, here's the thing about Smith, and about this book: it is told, and acknowledges it is told, from Smith's point of view, based on his own writings. In the final note from the author, she explains that "Smith's tales are told only from a Western European, Protestant point of view" and that "he may have embroidered his escapades." She also notes that the Pocahontas story (if it happened at all) may have been a ceremony. One thing that works for me for this book is that not only is it an exciting adventure story, but it is also a way students to discuss first hand documents (Smith's own writings) and how they, too, need to be evaluated. About the illustrations: Schanzer says that she did research regarding the authenticity of the portraits, whether it was regarding a Turkish warrior, French pirate ship, or Indian tattoo. A nice bibliography is included. For a historical fiction view of being captured by pirates and enslaved, check out the recent YA book, A True And Faithful Narrative, which also talks about the way 17th century narratives embroidered the truth to create a good story. Links: more about John Smith; the wiki entry about Smith. Keep this book in mind for the upcoming 400th Anniversary Of Jamestown. This PDF is about the discovery myth of Jamestown. Finally, Was John Smith A Liar? A January 2007 Workshop with Schanzer. If you have other books (fiction and non-fiction, and all ages) that can be used for the 400th Anniversary, please share them in the comments. Thank you, Liz. After reading your review, I put the book on hold at the library. I didn't even realize about Jamestown's 400th anniversary. Elisa Carbone's new book, Blood on the River: James Town 1607, is a must-read on this topic. I have my Blood on the River review all ready to go so will post it sometime this week; I really like what she did with this topic, and it was interesting to read these 2 books close together. And I also have Pocahantas by Joseph Bruchac on TBR pile. I also saw the Colin Farrell movie & disliked it very much; they made Smith & James Town boring. Blood on the River is outstanding!